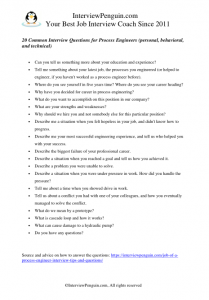 20 Tough Process Engineer Interview Questions - Ready to Answer? Process engineers can change the world. And if not the world, they can at least change the entire company and the results of the business, by improving the overall efficiency of the production process. This amazing job has just one catch–it is not easy to get it in an interview, and you have to prepare for difficult questions. Ready to learn how to crack this tough nut? On the following lines we will have a look at some practical, and some behavioral questions you will face in your interview. Let’s start! I can give you some ideas about this interview, and list questions you may get, but the truth is that in every good company you will deal with several case studies. You will have to demonstrate your way of thinking and practical skills when it comes to engineering processes. And there is hardly a way to prepare for such technical questions and tests in advance–either you know your job, or you don’t. But I can give you at least some advice on how to address these questions. When it comes to practical exercises, try to present your opinions in a right way. What does it mean? 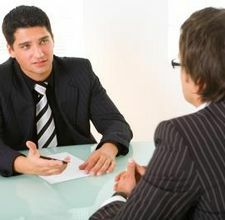 You should present your solution to a proposed problem in a way the interviewers can understand. They should see the benefits of your engineering, benefits for their company–in terms of tangible results your work will bring to the business, or to a particular business process. Do not try to look like the smartest person in the world. Stay humble, present your suggestions in a clear and simple way, and show some enthusiasm for the challenges that await you in their company. What is your attitude to the job? How do you see your role in their company? What is your motivation to work for them? How will you handle various interactions with your colleagues? All of these things are pretty important for the employer. Can you tell us something more about your education and experience? Tell me something about your latest job, the processes you engineered (or helped to engineer, if you haven’t worked as a process engineer before). Where do you see yourself in five years time? Where do you see your career heading? Why have you decided for career in process engineering? What do you want to accomplish on this position in our company? Why should we hire you and not somebody else for this particular position? Describe me a situation when you felt hopeless in your job, and didn’t know how to progress. Describe me your most successful engineering experience, and tell us who helped you with your success. Describe a problem you were unable to solve. Describe a situation when you were under pressure in work. How did you handle the pressure? Tell me about a time when you showed drive in work. Tell us about a conflict you had with one of your colleagues, and how you eventually managed to solve the conflict. Special tip: If you find these questions difficult, have a look at our Interview Success Package. It will make your life much easier in the process engineer job interview…. The most important thing is to stay honest, and human. To say that you always solved every problem, or never felt stress in your job, would not lead to a success in an interview, and to your new job contract. 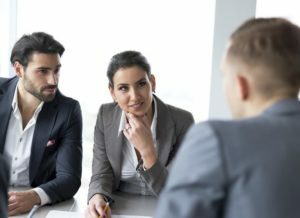 Once the behavioral interview ends, and once you have dealt with the case studies (or even before dealing with them), the interviewers can ask you a few simple, straightforward technical questions. Your answers to these questions help them to get a basic grasp of your technical skills, and theoretical knowledge of process engineering. What do we mean by a prototype? What is cascade loop and how it works? What can cause a damage to a hydraulic pump? To succeed in an interview for a process engineer position is not easy. 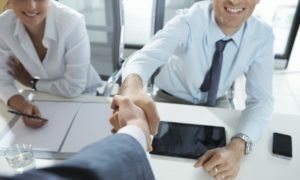 While you won’t compete with many other people for the job (typically less than five candidates in total), you will face a difficult interview. Personal, behavioral and technical questions, and the ever-threatening practical case studies…. Honestly, it is not easy to prepare for the technical case studies in advance, becasue you can not really tell the exact questions you will get. Either you know your job and are ready for the technical questions, or you won’t make it. On the other hand, you can prepare for the personal and behavioral questions–the part of the interview that is equally important. Check our Interview Success Package to get access to great answers to all difficult questions, and to learn how to impress your interviewers.